Last weekend, guests celebrated at Hawaii’s third annual Celebrity Chef Tour benefiting the James Beard Foundation at the Mauna Lani Bay Hotel & Bungalows. On Saturday night, former chef and now international award-winning cocktail mixologist, Manny Hinojosa, prepared a selection of exclusively designed cocktails using Hawaii’s bountiful fruits, vegetables, flowers and herbs including the Oxley Indochine. The signature cocktail made with Oxley Gin, Martini, Rossi Bianco, Kalamansi and Thai Basil was perfectly paired to complement the flavors of an unforgettable six-course dinner prepared by celebrity chef’s including Jonathan Waxman, Aaron Sanchez, Nancy Silverton, Bruce Bromberg & Mauna Lani’s own Clayton Arakawa & Allen Hess. 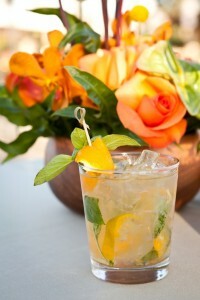 Shake and serve over the rocks, garnish with Kalamansi peel and Thai basil. This entry was posted in Events and tagged cocktails. Bookmark the permalink.